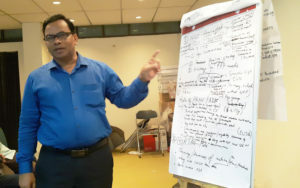 To address high malnutrition among children in four poverty-stricken districts in Bangladesh, a pilot project with partners across the peanut value chain was launched recently. “The project builds an ecosystem of partnerships to deliver nutritional and livelihood outcomes on a large scale through innovations along the peanut value chain. It brings together Bangladesh Agricultural Research Institute (BARI) and ICRISAT, partners in science of discovery; and partners like NGOs and processing industries in the science of delivery,” said Dr David Bergvinson, Director General, ICRISAT, at the launch. The new project will emulate a successful model of public-private partnership implemented by Christy Friedgram Industries (CFI)-Tamil Nadu, India, to achieve nutritional outcomes among the target population, and build on the outputs of earlier collaboration between BARI and ICRISAT. Peanut-based food supplements: Three energy- protein- and micronutrient-dense products were identified for acceptability studies – multi-millet peanut bar (30% peanuts) developed by CFI; peanut cookies (26% peanuts), and peanut-based spread (36% peanuts) developed by the NutriPlus Knowledge (NPK) Program of ICRISAT. 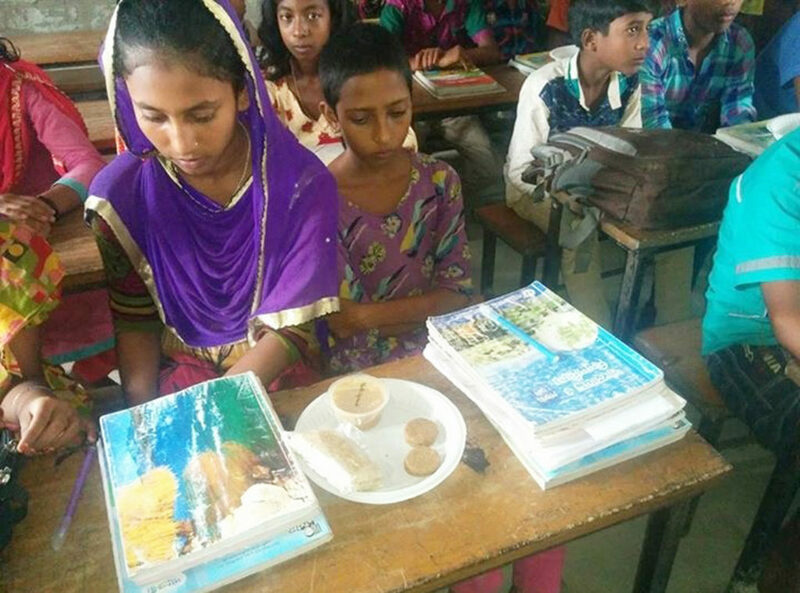 An acceptability study was carried out jointly by ICRISAT and BARI, for all the three products among a representative sample of school children (5 to 10 years of age) in Belgasha Government Primary School, Jamalpur District, Bangladesh. The acceptability study showed that multi-millet peanut bar and peanut cookies are acceptable to the school children and preferred over the peanut spread. The products will be further refined at NPK Program by incorporating locally available grains from Bangladesh and the technology will be transferred to PRAN Agroindustries (PRAN) in Dhaka, Bangladesh, for local production. Innovation in breeding: PRAN prefers bold kernel peanuts in its processing, so BARI will test advanced breeding lines that combine bold kernels with foliar fungal disease resistance and early maturity. High oleics are also preferred by PRAN for their shelf life; this will also be tested by BARI. 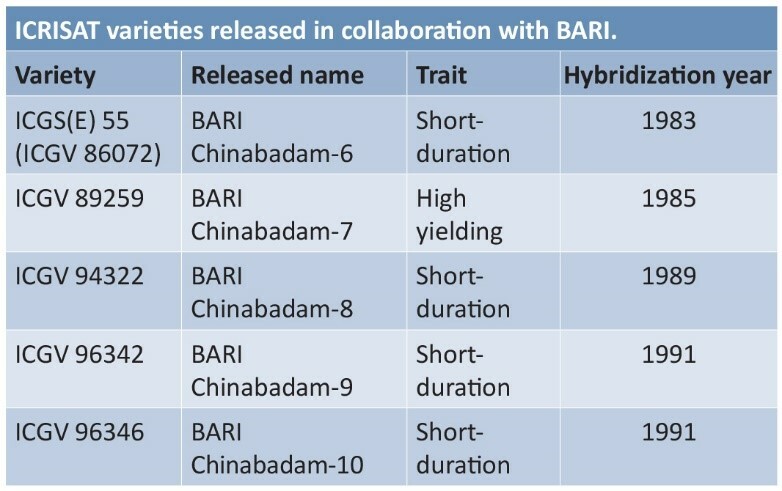 Dr BK Goswami, Director Support Service, BARI, noted that 10 peanut varieties were released in Bangladesh and the collaboration between BARI and ICRISAT had resulted in the release of five advanced breeding lines selected from international nurseries shared by ICRISAT (see table). In this pilot project, the short duration varieties ICGV 94322, ICGV 96342 and ICGV 96346 will be used. ICRISAT’s peanut breeding program, along with the genomics and pathology groups, has successfully combined foliar fungal disease resistance with early maturity. 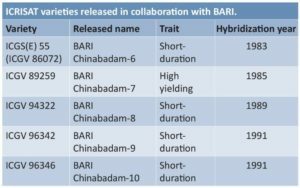 Extensive field phenotyping for early maturity based on cumulative thermal time (CTT) and seed size enabled to combine these two traits. More recently, high oleic lines in Spanish and Virginia types were developed at ICRISAT using near infrared reflectance spectroscopy (NIRS) phenotyping and single-nucleotide polymorphism (SNP) based genotyping. “Process innovation in breeding and testing pipelines enabled combining desirable traits in a single variety,” said Dr P Janila, Principal Investigator of the project and Senior Scientist – Groundnut Breeding, Crop Improvement, Asia Program, ICRISAT. Improved seed systems: A model wherein the processing industry arranges supply of seeds of improved varieties to the farmers, and later buys the commodity from the farmers will be promoted in this project in collaboration with BARI, PRAN and the NGO – Agriculture Development Foundation (ADF). BARI and ADF will be involved in seed supply and enhancing adoption of ICM and GMP. This model enables farmers to procure quality seed of improved varieties and the processor is able to source quality peanuts. The project launch and work plan meeting was held at Dhaka from 4-5 July with over 40 stakeholders from BARI, PRAN, ICRISAT, Bangladesh Institute of Research and Training on Applied Nutrition (BIRTAN), Department of Agriculture and Extension (DAE), the SAARC office, and local NGOs – International Development Enterprises (iDE) and ADF. Dr SM Bokhtiar, Director, SAARC Agriculture Center, said that there was a possibility of expanding the project to other SAARC countries. Dr PM Gaur, Theme Leader – Crop Improvement, Asia Program, ICRISAT, said that this is a unique project that encompasses innovations along the complete value chain, from farmer to consumer. Lesson learnt Partnership with BARI Sharing of international nurseries with national partners leads to identification of superior lines with local adaptability and their subsequent release/commercialization. Identification of target sites for the project was based on two criteria. First, poverty and malnutrition are high; second, peanut is an important crop cultivated in the target regions and PRAN currently sources its peanuts from these sites. The districts – Kurigram, Lalmonirhat, Panchagarh and Jamalpur – are situated in northern Bangladesh. River erosion is a natural phenomenon here and thousands of families become landless in these districts during August–November. The lack of income reduces their ability to cover their nutrition requirement. According to the World Food Programme, 40 million people – a quarter of the population in Bangladesh – remain food insecure and 11 million suffer from acute hunger.